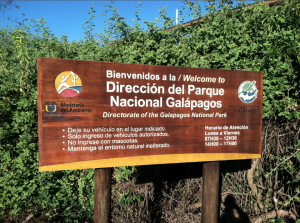 On June 25th, the night before the Conference commenced, most participating members, including the United States contingent, visited the Directorate of the Galapagos National Park to enjoy some of the unique island wildlife. Participants were most keen to observe the raising of tortoises in captivity for eventual release back to the wild, a project conduced by The Charles Darwin Research Center, located in the national park. The group felt the careful practice of raising endangered tortoises to restore dwindling populations was deeply relevant to similar efforts for sea turtles. The Darwin Research Center naturalists take particular care in raising different turtle species by separating them into island of origin as hatchings. Segregating fledging turtles by island preserves the revelatory diversity deeply admired by Darwin. The tortoises raised at the center need only be raised to a size large enough not to prevent their nature predators, like island rats or feral hogs, from threatening them. The Darwin Center uses PIT tagging. Small microchips placed under the skin track the tortoise’s progress and movements, essential to long-term research. Poignantly, the recent 2012 death of the sea turtle “Lonesome George” shows the value of cataloguing turtle origins. 100-year-old Lonesome George was the last turtle indigenous to the Ilsa Pinta and his death marked the total extinction of his subspecies. The Galapagos National Park and the Darwin Research Center also supports the reproductive and rehabilitative program for the islands’ massive land iguanas. 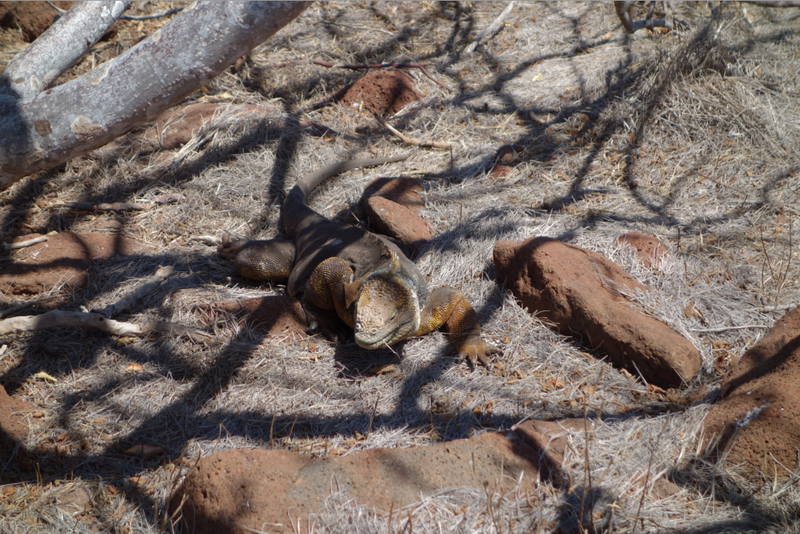 Two of these species of iguana are only found on the Galapagos Islands and are they are the largest iguanas in the world. All the Sea Turtle Conference participants were heartened to hear the iguana population is being successfully restored after their numbers hit a dangerous bottom of one hundred in 1976. Beginning in the late 1940s, island iguanas met the most rapid decline of any reptile population in history, victims of habitat destruction, cat and dog predation, and human harvesting. Competition for food with invasive species such as goats also threatened iguanas until the island government removed the excessive populations of predatory invaders. The park flora also represents many species of plants that exist nowhere else on Earth. This includes the only living cactus species that grows on towering, thick trunked trees. 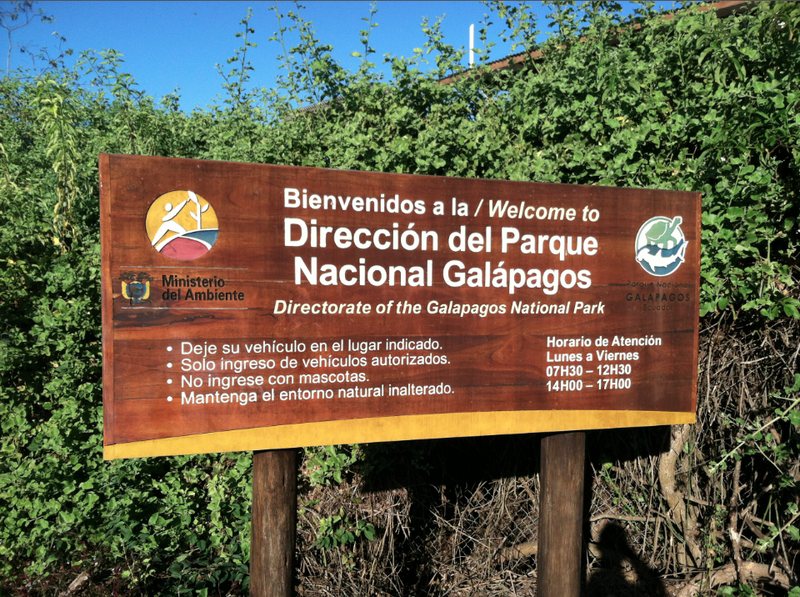 Truly, the Galapagos National Park and the Darwin Research Center are struggling mightily to preserve one of the most unique and fascinating biospheres on earth. The picture to the above right shows some of the participants. 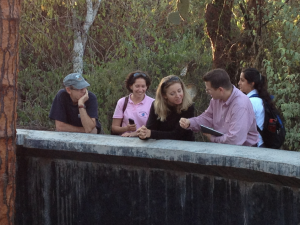 On the far left and third from the left are two of the four delegates from the United States: Mr. Earl Possardt, and Ms. Marlene Menard, a foreign affairs officer of the Office of Marine Conservation in the State Department. (The not pictured third delegate is Patrick Pearsall, a lawyer for the State Department.) 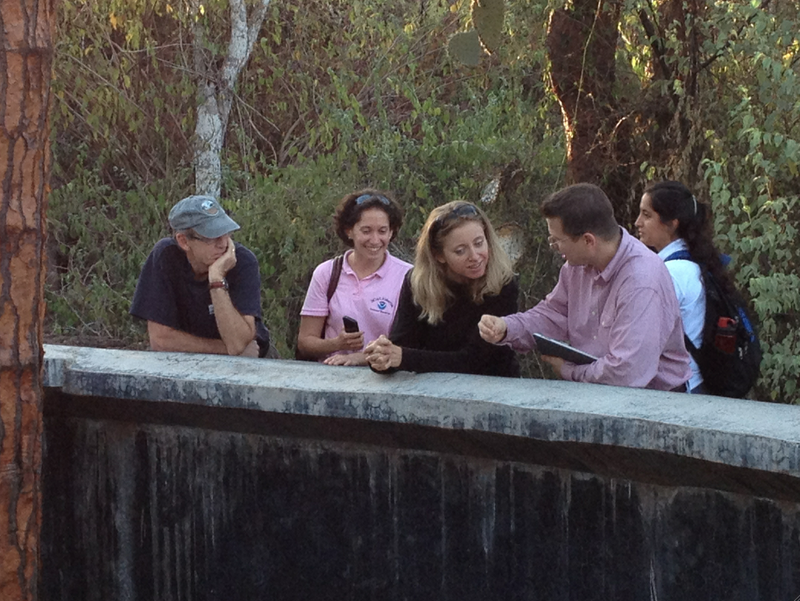 The woman wearing the pink shirt is the chairman of this conference, Ms. Alexis Gutiérrez. She is also representing from the U.S. delegation. A doctoral student at the University of Oxford currently studying at the School of Geography and the Environment her role is the presiding over the proceedings of the conference. To the far right front is Professor Gardner, an official observer and the representative for the Stetson University’s proposal to host. Also present but not pictured were Ms. Rebecca Regnery, Deputy Director of the International Humane Society, and Dr. Karen Eckert, Executive Director of Widecast Conservation Network.